When baking muffins, the butter in your recipe contributes to the texture and moisture in the cooked muffin. Luckily, running out of butter does not mean you have to make a quick trip to the store or forget about making your favorite muffins. A variety of different butter substitutes enable you to make your favorite muffins, often yielding a final treat that is lower in fat and calories. Substitute margarine or vegetable shortening equally for the butter in your recipe. For example, if your recipe calls for 1 cup of butter, replace that with 1 cup of margarine or shortening. Mix into your muffin batter in the same manner you would the butter. If your recipe calls for melted butter, you may substitute equal amounts of oil, instead. Replace the butter with a fruit or vegetable puree. While applesauce works well in most recipes and is already pureed, other fruits and vegetables make good substitutions while complimenting the flavor of the muffin. Simply place the fruits or vegetables in a food processor and blend until smooth. Fruit and vegetable purees substitute at half the amount of butter in the recipe. For example, if your recipe calls for 1 cup of butter, replace with 1/2 cups of fruit puree or 3/4 cups of vegetable puree. Substitute the butter in your muffin recipe with yogurt or sour cream. Like fruit purees, yogurt or sour cream replaces the butter in your recipe with only half the amount. If your recipe calls for 1/2 cups of butter, replace with 1/4 cups yogurt or sour cream. Choose a puree flavor that compliments your muffin. For example, pureed blueberries add color and additional flavor to blueberry muffins while prune puree contributes to a rich dark brown color in chocolate muffins. If you want to retain some of the buttery flavor in your muffins but still want to reduce the fat and calories, consider replacing half of the butter with a butter alternative. For example, if your recipe calls for 1 cup of butter, use 1/2 cups of butter and 1/4 cups of yogurt or fruit puree. 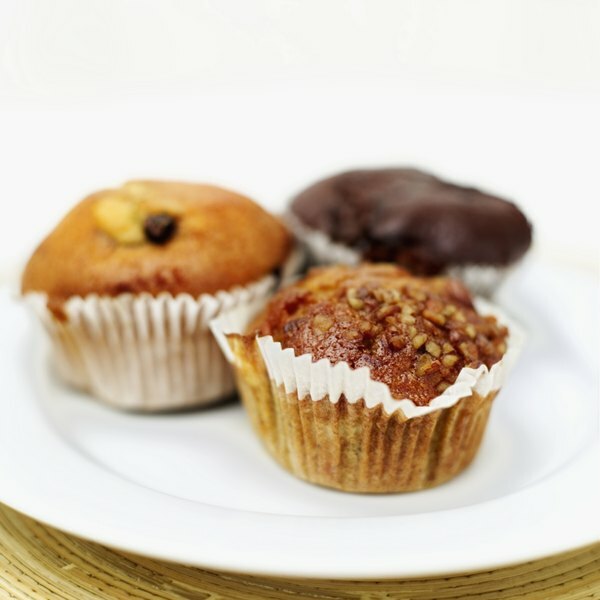 When omitting traditional fats, such as butter, muffins can become dense in texture. To avoid this, consider using cake flour, in place of all-purpose flour or increasing the sugar by a tablespoon or two. If your recipe includes eggs, separate the egg whites and beat them until fluffy. Gently fold them into the batter. Omitting fats in a recipe can also reduce the necessary cooking time. Follow your recipe for oven temperature, but begin checking your muffins 10 minutes sooner than the recommended cooking time. Insert a toothpick into the center of the muffin. If it comes out clean, cooking is complete. If not, recheck in 2 to 3 minutes until they are done. If using sweetened applesauce or yogurt, reduce the amount of sugar in your recipe by a teaspoon or two to avoid an overly sweet muffin.